You might have heard about Nowruz peripherally. The United Nations formally recognized it as an international holiday in 2010; President Obama extended Nowruz greetings to observers every year of his administration since 2009 . Then-first lady Michelle Obama even held a Persian New Year celebration at the White House in 2015, complete with the Obama family’s own haft-seen (more on what a haft-seen is here). If you didn’t grow up celebrating Nowruz like I did, though, the concept might be confusing — actually, it was even a little confusing for me, since my childhood memories of Persian New Year mostly concerned salivating over the delicious food my mother would make in its honor. But once I started to learn more about what Nowruz means outside of food — which, to be fair, is an important part of most holidays on this planet — I realized how fascinating its layered traditions really are. Nowruz marks the end of the old year and the beginning of a new one, and it occurs on the day of the vernal equinox. More accurately, the new year begins the second the equinox does — so, not just at the stroke of midnight. Usually, the equinox happens from March 19 to 21. After thousands of years in the making, Nowruz remains too beloved, universal, and deeply embedded in Persian culture to ignore. And because the holiday has been around for so long, it suffers no shortage of related traditions. But there are nevertheless a few basic, foundational tenets that nearly everyone who celebrates Nowruz — in Iran and elsewhere — upholds. 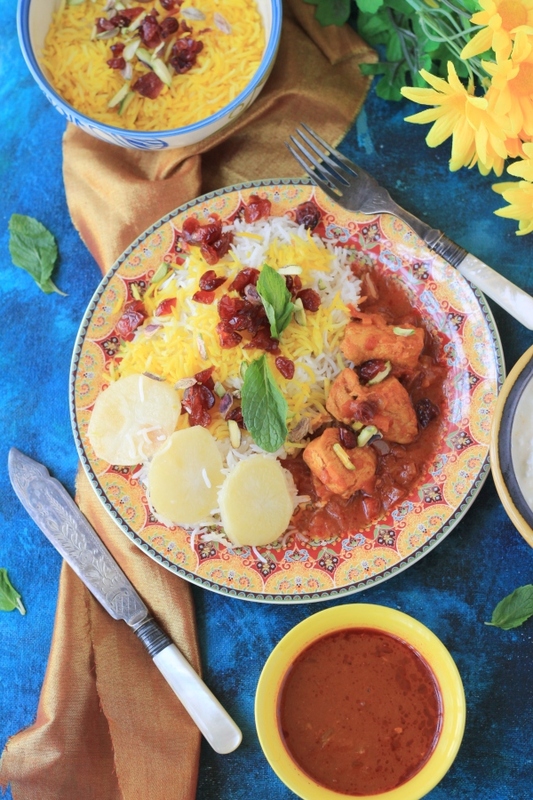 Zereshk Polo ba Morgh is a Persian classic made with Zereshk (barberries), Morgh (chicken), and Polo, which is the steamed and fluffy Persian rice. 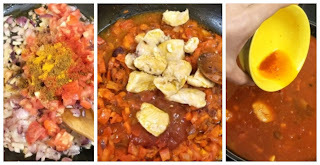 This is one of the mixed rice dishes that you will find at small casual get togethers, as well as larger Persian dinner parties, weddings and most festive celebrations and holidays. The chicken is the main component of this recipe and it is cooked separately in a tomato saffron sauce, so it is easy to make in large amounts; the same goes for the rice. 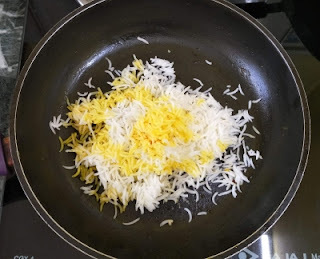 This is why Zereshk Polo Ba Morgh is a favorite “mehmooni,” or party rice dish in Iran. This festive rice is steamed and layered with a mixture of red zereshk berries and golden fried onions, then garnished with almonds and/or pistachios. . 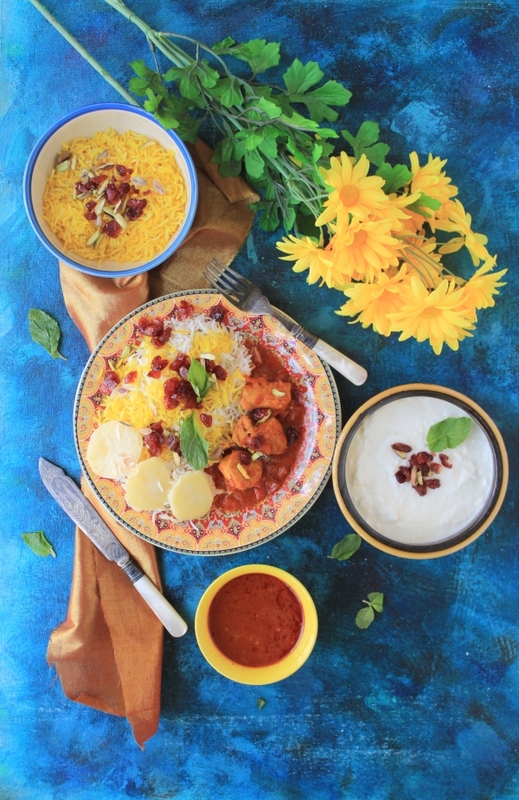 The tiny ruby red barberries “zereshk” add a tangy flavor to this khoresh and they are grown in the eastern part of Iran, in Khorasan province. There is also another species of zereshk which is less tart and much darker in color, and it’s actually called “zereshk e siah” meaning black barberry, that is grown in Kermanshah province in the western part of Iran. Unfortunately I couldn't find any soon enough, so made do with cranberries. I happened to later find out that Barberries are available on good ole Amazon too!, oh well!, wish I would have checked earlier!. 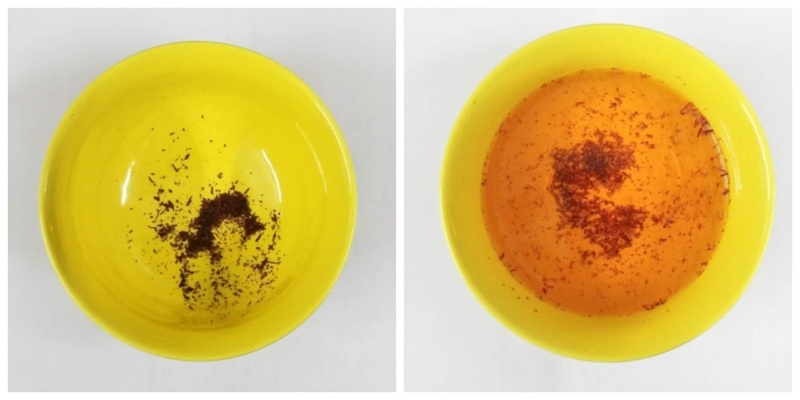 Start by dry roating the saffron strands for 20 seconds, then powder them using the back of a spoon. Transfer these to a small bowl and fill with 1/2 cup hot water and keep aside. Lets start making the rice. In a large pot cook the rice, along with salt in a lot of water, once the rice is half cooked, drain off the water in a colander and keep aside. 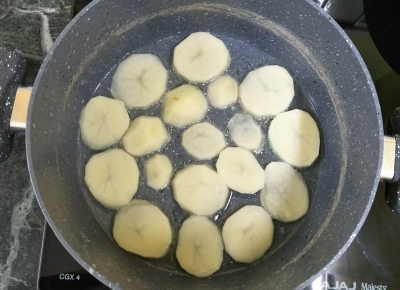 In the pot that you cooked the rice, put in the oil and butter, once slightly hot, put in the sliced potatoes. Cover these with the par boiled rice. 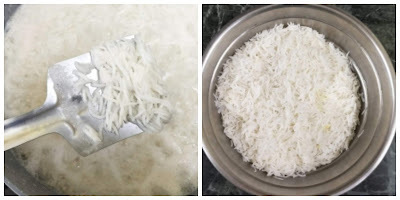 Make the shape of a mountain with the rice and make a few holes, with the back of the spoon. Gently drizzle 1/2 cup of reserved rice water all over this rice and also fill in some of the holes with small cubes of butter. Cover the pot with a clean cloth, and then place a lid over it. 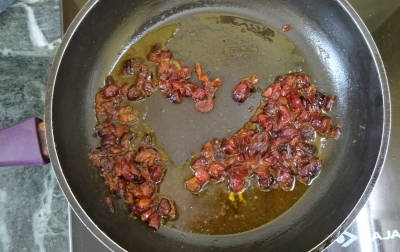 Cook this on your lowest burner on low heat for 35 - 40 minutes. Once cooked, switch off the flame, remove the lid and allow to air dry till you prepare the chicken. In a small pan saute the berries with a 1 tablespoon butter and 2 teaspoons sugar, add in 2 tablespoons of the prepared saffron water and allow to cook off. Take half cup of the cooked rice and add in two tablespoons of the saffron water to it, saute for a minute on low flame and set aside. 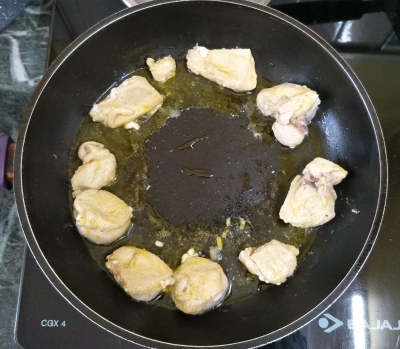 Heat 1 tablespoon of oil in a pan and cook the chicken for 4 minutes on each side on a medium flame. Now in the same pan put in 2 tablespoons oil and fry the onions till golden, next add in the tomatoes, tomato paste and all the spices, along with the salt. Mix well and add in 1 cup water. Add in the fried chicken pieces and finally the remaining saffron water. Allow to come to a boil, the switch off the flame. Use a large spatula to transfer ⅓ of the steamed aromatic rice to the serving platter, top with ⅓ of the barberry mixture and continue layering and finish the top with the remaining zereshk. Garnish with sliced almonds and/or pistachios. Serve the chicken and Potato Tahdig on a separate platter. Zereshk, or barberries are red tart berries that are available at Persian markets and online. If unable to purchase zereshk, you may substitute with dried cranberries, keeping in mind that most dried cranberries have been sweetened with sugar and will give this dish a sweeter taste. Labels: Mains, Parsi Cuisine, Party Perfect!